Dulverton is one of the main towns of Exmoor situated on the south edge of the moor. The town stands, in the heart of West Somerset and close to the Devon border, between the Rivers Barle and Exe, which meet a little further down the valley. 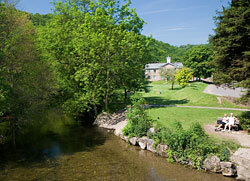 The Barle is crossed by an attractive, three arched bridge and there are some pleasant walks along the river bank. There are often artists painting down by the river and the bridge. Exmoor House, the headquarters of the Exmoor National Park Authority, stands beside the river. Located in the main square is the Dulverton National Park Visitor Centre, housing exhibitions about the heritage of the town and the importance of the surrounding woodlands. There is also an art gallery and library within the complex. The town has a small shopping centre with a number of small stores, including quality boutiques, galleries and gift shops. There are various cafés and other eating places, including several pubs. The town centre should be avoided by larger vehicles, as parts of it are quite narrow and there are some sharp bends on the road leading into Exmoor National Park. 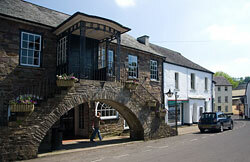 Most of the buildings in Dulverton date from Victorian times or are more recent. One claim to fame of the town is that George Williams, founder of the YMCA, was born in here in 1821. Within the town is a large park and duck pond and there are many local walks which are very pleasant. 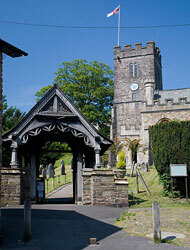 Riverside walks are popular and so are moorland strolls; Winsford Hill on Exmoor is just a few miles to the north. Not far away is the wild open moorland described in the novels of R.D. Blackmore. There is even a statue of "Lorna Doone".